After some renovations the inn will have a grand reopening on Memorial Day weekend with a more casual dining atmosphere. A Boston businessman is the new owner of Lambert’s Cove Inn, the boutique hotel and restaurant in West Tisbury. It will remain an inn and restaurant under the new owner. The property sold last week for $5.5 million. The buyer is John Cain. Scott Jones, who has owned the inn with Kell Hicklin for 13 years, confirmed the sale in a phone call with the Gazette Wednesday. He said the sale was a long time coming after first putting the property on the market in 2014. Burnout from trying to keep the hotel profitable and staffed contributed to the desire to sell, he said, along with health problems suffered by Mr. Hicklin that caused Mr. Jones to shoulder much of the workload. “It’s a bit more of a business than one person can run,” said Mr. Jones. Mr. Jones said he and Mr. Hicklin plan to move into a new home in Greenville, S.C. before deciding on what they will do next. The new owner said guests this summer can expect to see cosmetic changes in the 15-room establishment, including new paint, furniture, carpeting and artwork. The renovated inn will have its grand reopening Memorial Day weekend. Mr. Cain, who currently lives outside Boston on the south shore, said he recently sold a financial technology company he founded five years ago. He said he’s been coming to the Vineyard since he was a boy, and after the sale of his company he was eager to find an opportunity to live on the Island. This winter he saw online that the inn was for sale through Conroy & Co. Real Estate, the listing brokers. He reached out to inquire, and after three months of talks, the sale was finalized last week. Rebecca Conroy represented the buyer. 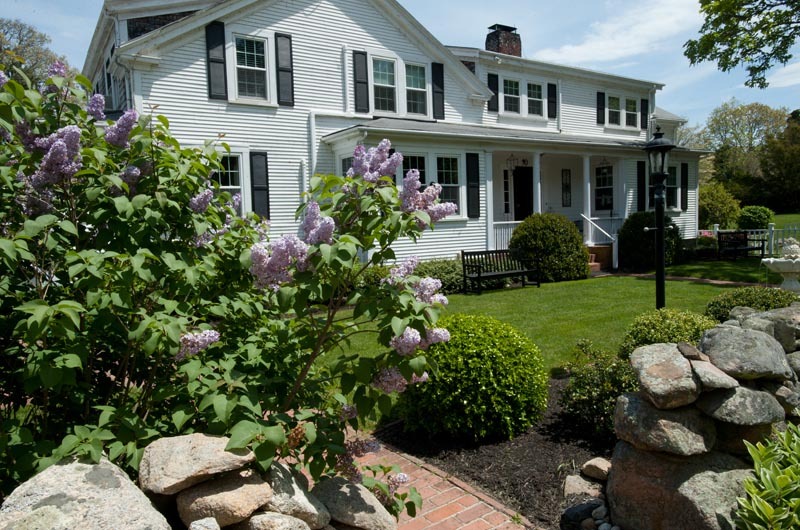 “It’s been a dream of mine for forever to run a boutique inn in New England,” said Mr. Cain. Mr. Cain said he plans to keep the restaurant under the care of chef Joe DaSilva, but will give it a more casual atmosphere. He said dinner will be served every night of the week along with a Sunday brunch. “We’re going to get away from fine dining and make it a place that’s not just for special occasions,” he said. The biggest addition, pending approval and permitting, would be an open air barn on the property that would host weddings and receptions. The hotel will be open nine months of the year from April though December. Mr. Cain emphasized that though the building is undergoing renovations, he wants to embrace and preserve its history and keep it a family business for generations to come. Best wishes to Scott and Kell, you deserve "retirement" after working so hard to make the Inn what it is today, all my very best to the two of you guys......Memories last forever, make more happy ones! Good luck. We will miss the gardens and the blooming flowers. Hope to see you before you go on Norton Point. Good luck with your retirement. My wife, son, and I have been eating at the Inn since 2003 and have never had a bad meal there. We look forward to trying it this summer! We will miss you and we will always keep a space on our beach blanket for you. All the best to you, Scott and Kell. I have great memories of the inn in the 1970s and my wife Heidi and I have wonderful memories of our wedding at the inn in 2006. We love you both and, perhaps, we can visit you in Greenville (a lovely city), since Charlotte is only and hour and a half away. Scott and Kell, Best of luck to you both in whatever you decide to do. I will always cherish the memories of Brian and Megan’s wedding, despite the rain, at the inn. Best wishes Scott and Kell. We know you are eager to focus on your South Carolina home. We very much enjoyed staying at the Inn last year. Warm regards. Congratulations John Cain. Good luck with your dream of owning the magical Lamberts Cove Inn.